The Water Otter/River Otter craft is the oldest, most trusted, personal pontoon boat ever constructed. The innovative pioneering and engineering efforts over the years has resulted in a pontoon fishing boat that sports functionality as well as durability. As the original designers of this type of craft, we are constantly encountering Otters that are 20-25 years old and still in service. Our nitch market continues to be the angler who wants a lightweight kick boat type craft, yet does not want to sacrifice strength or quality for it. 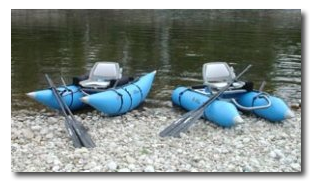 These unique watercraft are truly the premier personal fishing boats of our time. It’s been some 30 years since the Water Otter first graced our nations waterways, and it will continue to be a presence as long as sport fishing continues to be one of America’s recreational passions. So whether you are fly-fishing, site-seeing or just plain recreating, we hope that your experience with this one of a kind pontoon kick boat is as rewarding to you as it has been for many thousands of other anglers across the country. And don’t forget to check out our exclusive “RodRight” Rod Holder. A remarkably simple product to accessorize your Craft with. Feel free to mail or e-mail us your vintage Otter photos and your comments regarding your experiences with either of these craft. TheWater Otter/River Otter craft is the oldest, most trusted, personal pontoon boat ever constructed. The innovative pioneering and engineering efforts over the years has resulted in a pontoon fishing boat that sports functionality as well as durability. As the original designers of this type of craft, we are constantly encountering Otters that are 20-25 years old and still in service. Our nitch market continues to be the angler who wants a lightweight kick boat type craft, yet does not want to sacrifice strength or quality for it. These unique watercraft are truly the premier personal fishing boats of our time. It’s been over nineteen years since the Water Otter first graced our nations waterways, and it will continue to be a presence as long as sport fishing continues to be one of America’s recreational passions. So whether you are fly-fishing, site-seeing or just plain recreating, we hope that your experience with this one of a kind pontoon kick boat is as rewarding to you as it has been for many thousands of other anglers across the country. And don’t forget to check out our exclusive “RodRight” Rod Holder. A remarkably simple product to accessorize your Craft with. Feel free to mail or e-mail us your vintage Otter photos and your comments regarding your experiences with either of these craft. President, Water Otter Inc .
We do not sell or otherwise furnish or transfer your information to any other entity. We thank you for your business.